When President Donald Trump said he’d meet Iranian leadership with “no preconditions” on Monday, he once again defied conventional US foreign policy. This time, however, it may just be the right move. For decades, American leaders have typically rejected meeting adversaries without setting strict conditions beforehand, although there were some prominent exceptions in both Republican and Democratic administrations. One reason had to do with domestic political pressure; the president’s opponents would claim the commander in chief was weak or naive to hold the meeting. There’s also the perception that one-on-one face time with a US leader is a gift. Offering that reward to an adversary could increase the other leader’s global stature, while the US would likely get very little in return. Trump, however, doesn’t seem to care about any of that. “Speaking to other people, especially when you’re talking about potentials of war and death and famine … you meet,” he said on Monday during a press conference. The president’s willingness to chat up America’s enemies has, unlike most of his decisions, received widespread support from US foreign policy experts. But Trump is an unlikely symbol for this engagement with rogue regimes. He’s uniquely unprepared for summits with adversarial world leaders, which experts routinely note are harder than any other kind of meetings for any American leader. For example, Trump has yet to make substantial progress on ending North Korea’s nuclear program or improving relations with Russia, despite meeting Kim Jong Un and Vladimir Putin. That means that while Trump plays up diplomacy with adversaries as a good thing for US foreign policy, he also potentially puts American interests at risk when he pursues those meetings without a strong agenda or plan. 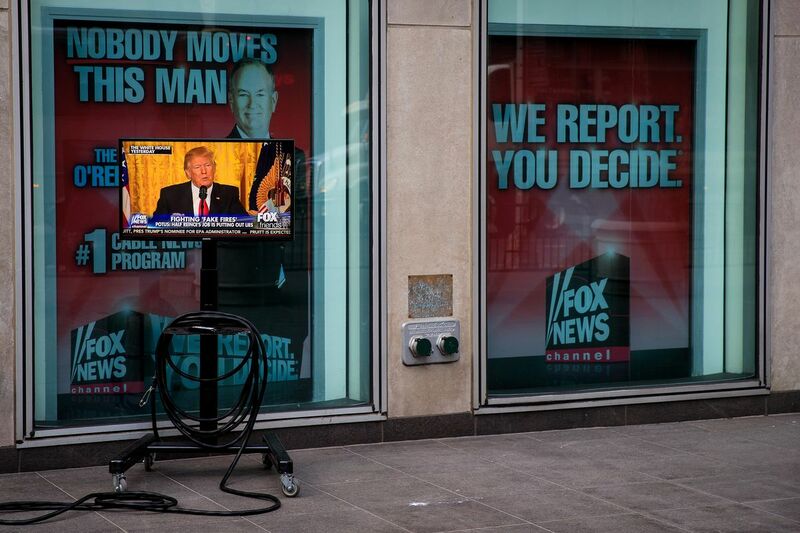 A clip of President Donald Trump’s press conference is played on Fox & Friends. As Michaela Mattes and Jessica Weeks wrote in the Washington Post in May, a president with a hawkish foreign policy, like Trump, tends to receive less domestic backlash when meeting an adversary. Take when Trump sat with Kim Jong Un in June. Republicans backed Trump’s diplomatic opening to Kim, and even came to like the North Korean leader more than top Democrat Nancy Pelosi from California. Sean Hannity, a Fox News Host and one of Trump’s most fervent supporters, praised the president’s decision to accept Kim’s invitation to meet. Former President Barack Obama didn’t receive the same backing when he said he’d meet with the leaders of countries hostile to the US. Here’s Hannity again, just one week before the 2008 election. As president, Obama received widespread backlash from Republicans and Democrats alike for his diplomatic outreach to Iran to sign a nuclear deal. Part of that was due to entrenched lobbies that advocated against any engagement with Iran. Consistently decrying the talks was a way of exerting enough outside pressure to derail the deal. But it also had to do with the view that Obama was particularly weak on foreign policy and was apologizing for America abroad — all while making bad countries look good. “Engaging in personal diplomacy with what we used to call rogue states comes to be seen as blessing or approving of those states’ character,” Paul Musgrave, a US foreign policy expert at the University of Massachusetts Amherst, told me. Caring too much about a US president meeting with an adversary “leads to poisonous atmospheres and creates expectations that pretty much any form of contact between the US government and the pariah regime is toxic,” he continued. Trump doesn’t have that problem, though, perhaps due to his heavy reliance on the military and his tough talk on Twitter. Whatever the reason, it’s given him the political space to talk with whomever he wants — like some of the world’s most brutal dictators. President Donald Trump meets with North Korean leader Kim Jong Un in Singapore on June 12, 2018. Not all criticism of talking with adversaries without preconditions is based purely on politics. Georgetown University’s Daniel Nexon, a US foreign policy expert, helped me understand that there are three strategic reasons why this could be a bad idea. The first, as mentioned above, is that holding a meeting gives legitimacy and status to an adversary. Think back to the Trump-Kim summit: When the president shook the North Korean leader’s hand in Singapore, he effectively welcomed him as a top leader on the world stage. North Korea experts note that Pyongyang for decades has called for a meeting with the US president to gain that status. 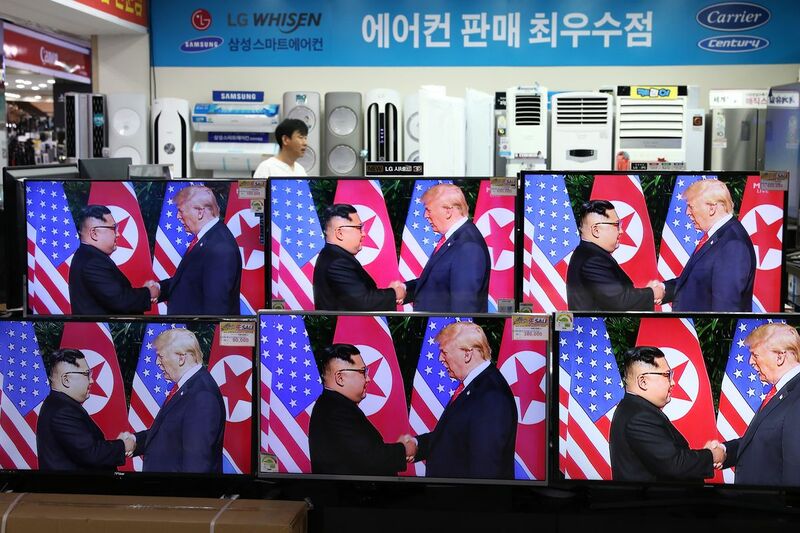 Trump delivered, and Kim finally achieved that goal. The second reason is more logistical: The president’s time is a precious thing. If he meets with North Korea as opposed to, say, allies in Europe, it could send the wrong signals to some of America’s key friends. Finally, most meetings don’t happen without a lot of preparatory work done at lower levels. It usually takes staffers months or even years to set the agenda for a bilateral chat to ensure the meeting isn’t a waste of time. The agenda, in a way, is a de facto condition — leaders will only talk about specific topics for a set amount of time. The problem is adversaries don’t talk regularly, and the US-Iran ties have mostly been severed under the Trump administration. Therefore, if Trump were to meet with Iranian President Hassan Rouhani, the meeting could ultimately prove to be fruitless because staffers haven’t had much time to work on important issues. “Talking with adversaries is fine, but those talks will be for show if there isn’t significant spadework up front,” Elizabeth Saunders, a foreign policy expert at George Washington University, told me. 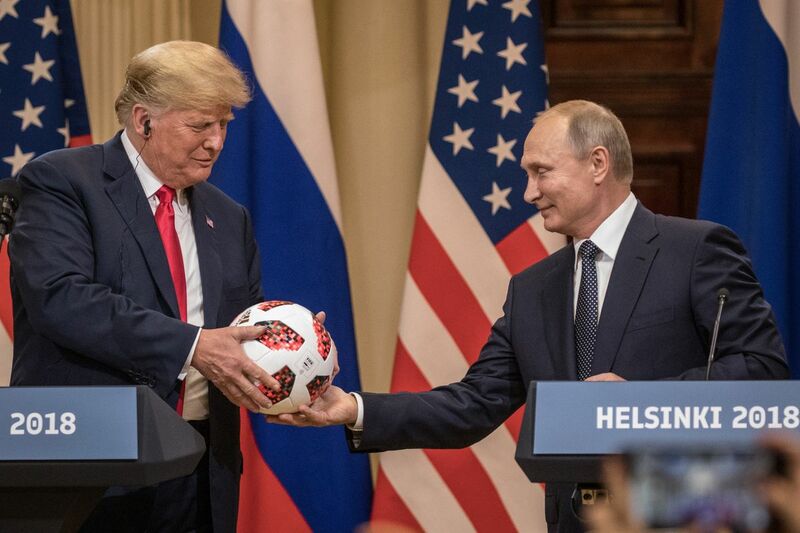 Russian President Vladimir Putin hands US President Donald Trump a soccer ball during their meeting on July 16, 2018. So should Trump change course and stop offering to meet with adversaries? No, but there is something he needs to change: his attitude toward preparing for talks. “What should concern us about Trump is not the lack of preconditions but the apparent lack of preparation or process when the meetings occur,” Goddard told me. There’s evidence for this in Trump’s meetings with Kim and Putin. Trump left Singapore after signing a declaration with Kim that contained few specifics on how to end North Korea’s nuclear program. Trump, however, insists that there is no more nuclear threat from the country, even though Pyongyang seems to be building more missiles. Indeed, there’s more evidence indicating that the summit was a failure rather than a success, mostly because North Korea has shown no real signs of dismantling its nuclear arsenal. And Trump’s meeting with Putin didn’t go any better. The president spent more time bragging about his election win and berating special counsel Robert Mueller’s probe into possible Trump campaign collusion with Russia than coming close to a diplomatic deal. More than two weeks later, it’s still unclear if Washington and Moscow came to any sort of real agreement at all. The other reason could be more personal for the president. “I worry that he likes [holding meetings] for the wrong reasons — they appeal to his ego and to his brand as the greatest dealmaker who ever lived — and so I’m not sure there’s much upside,” says Nexon. Put together, Trump’s instinct to hold meetings with adversaries is still positive — but unless he’s careful, he could end up hurting US foreign policy interests because he’s more focused on how good they make him look, rather than achieving tangible results. “I just don’t think we have much evidence that Trump is terribly good at these meetings,” Nexon said.